The Slender Spoon is a bent, ultra-light spoon that offers loads of flash and flutter on the fall, unlike any other bait on the market. It comes complete with a size 1 or 2 snap, which further promotes erratic action. Silver, gold, nickel, copper, and black nickel finishes with holographic prism and glow accents ensure a pattern to match any fishing scenario. It’s still a fish-catching classic after all these years. The Slender Spoon shines when searching for active fish. 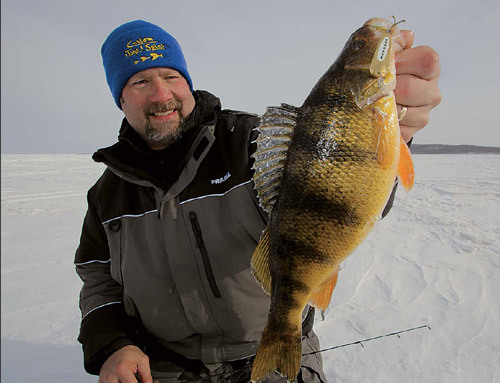 Its unique thin and beveled body provides more action and flutter on the fall than any other ice jigging spoon. It also increases fishable space, fluttering far off to the sides of your hole with a long cycling time to attract fish from afar. 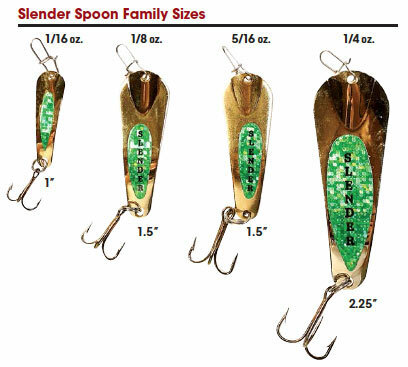 The small, 1/16-ounce Slender Spoon is ideal for panfish, especially tipped with a chandelier of three or four spikes. Or replace the treble hook with a single hook or a size 10 Shrimpo. As far as cadences go, both subtle shakes and rapid jig and pause methods can be top producers, as well as high rips and flutters on slack line. The larger 1/8-ounce, 1/4-ounce and super heavyweight 5/16-ounce (which is a heavier spoon with the same footprint as the 1/8-ounce) are ideal for open water walleye and larger gamefish species. Tipping the treble with a minnow head or perch eye (where legal) is a great way to add a bit of scent and really fire up schools of fish! Jigging Slender Spoons For Big Winter Pike! These spoons are incredible. They should be called " slaughter spoons " . Took them to a interior lake where the bite was slow for a lot of guys. 3 of us ended up limiting out both days. We couldn't keep them off. Biggest trout was 26" . Best time I've had on the ice. Can't wait to try them on my local river for steelhead. I'll be ordering more soon. I use the small spoon for ice fishing gills tipped with a wax worm. It can’t be beat. If you have never used these give it a try the outcome is nuts. Awesome lures... 1st day using them caught roughly 30+ brookies and rainbow. Have used these lures on various species of fish and it seems they can't resist biting if they are anywhere close by. Used the slender spoon for the first time this year. I couldn't be more pleased. It's the lure that I start the day with, and usually don't have to quit using. Wish I would have found them sooner! I have five boys. We have been out several times for bluegill and perch. Each trip we consistently caught more fish with the slender spoon tipped with a wax worm. Orange on brass in the murky water and silver on silver in the clear. I'm hooked on the slender spoon. Always produces, never let's me down! It's just a universal lure that always produces, doesn't matter what your fishing for. Out fishes my buddies everytime. I'm a 100% believer, and got my buddies hooked also. This Slender Spoon has always produced for me and I have to reorder when I loose a few spoons. My only complaint is the treble hooks bend easily and also break. When I use the spoon with a single hook they don't produce the same. Please sell this spoon with a single hook with the same results as the treble hook set-up.